Looks like Amazon has sold out of the Kindle 3 (3G version) again! If you go look at their site, it shows a shipping delay of 3 – 5 days. The white version is available now, but it seems that people really like the darker color. 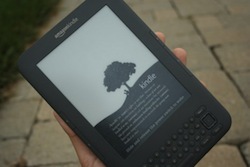 Of course, either the black or white Kindle 3 is a great reader, Nicholas certainly liked it.